@Sebastian-Roth Yeah it is, at least to one I did about 5 days prior and I hadn’t done any system updates. I won’t rule out the firmware, just think it would be unlikely as the end user wouldn’t have done any special updates and if it was a Windows one, I imagine I would have had more issues by or I might have seen someone else post on here now unless it’s only just came out in the past few days. Just wasn’t sure if this might have been a more ‘generic’ issue that some have come across. It’s the first machine I’ve ever had with this issue and I feel like I’ve done a lot of deployments/captures with FOG (well not really, probably around 50-100 surfaces over time). Will keep my eye out for it, unfortunately I’ve got the end user back on the machine for the time being as I was attempting to quickly roll them over to a replacement machine by capturing their image and pulling it back down to a new machine. Might be a little while before I get another chance to play. Will post back here with any updates the next time I try. I’ve left it like this for 15 minutes and nothing further happens. I tried to delete the host to do a quick registration to see if that would do anything different, it seems to kick it off and after it gets to the ‘init.xz…ok’ the screen just goes black and nothing else happens. This system works fine for other surface’s, so it’s just hanging on this one and I’m not really sure why. I’ve just updated my fog server to the latest update of 1.5.4 but this hasn’t made any difference. Agree with all Tom’s points, NFS is not a simple protocol to harden. What I recommend is VLANing your FOG network so it is manually exposed via your switch configs. Does require managed switching, but will accomplish the task. Yeah that was kind of what I was thinking as I believe you can restrict access to particular IP ranges and then just having it on another VLAN range which is accessible from my desk - given I usually do all imaging at my desk. Kind of thought the below would be the response but figured I’d ask the question as you guys know a lot more then me. 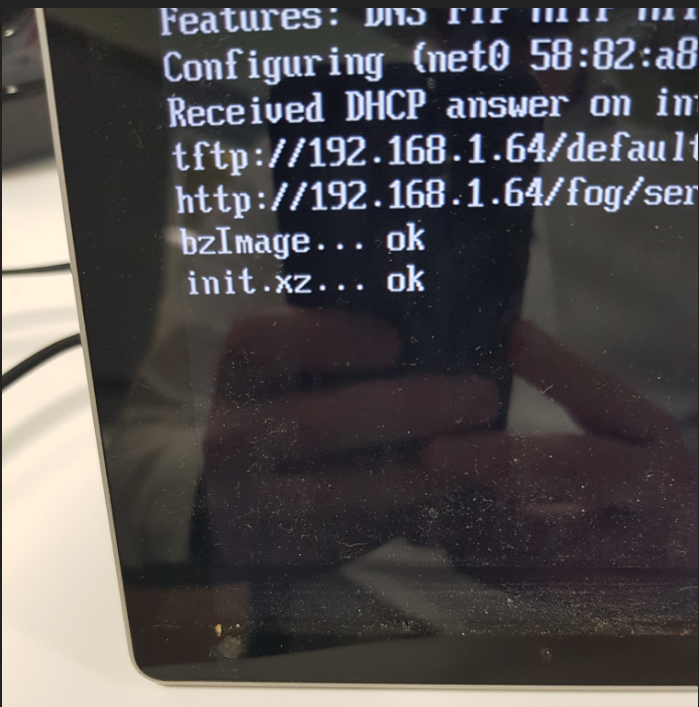 We recently had a penetration test done at my work where it was listed that the fog server has overly permissive NFS in where they were able to gain access to the images directory. I’ve done a bit of reading on what can be done to tighten up security but a few solutions I’ve seen such as Kerberos seem like it could potentially have impacts to how the fog server operates. I came across NFS security on the fogwiki - https://wiki.fogproject.org/wiki/index.php?title=FOG_security#Securing_NFS suggesting more to come soon however this was mid 2016, just wondering if there might have been an update? I don’t know a great deal in this area but I keep thinking that by securing it, will I then run into issues when trying to upload/deploy an image onto a random device? There’s also a section on ‘securing your images’, by doing the two steps mentioned in that section, would this in a way cover off ‘securing NFS’? I imagine it stops being able to connect to the images directory of the fog server without account access but if that was the case, wouldn’t that cover the securing NFS? Probably not that easy, my understanding in the area in minimal so I’m understanding the basics without fully understanding how it works. RE: FOG 1.5.0 BitLocker Issue Capturing Win 10 Image. So with the ‘manage-bde -off C:’ command, are people then turning that back on once the image is created/deployed? Or given Bitlocker isn’t on, not bothering? I suppose it’s made me think I should potentially look at turning bitlocker on for some staff members which will probably just be a manual process, but just wondering if I should then be turning the above command on when I do it. I don’t think that’s the case as I’m able to move a file from the FP server down to my computer at 60-110MB/s so I don’t think there’s any shaping of that kind on the network. Traffic shaping can be implemented on protocol/port basis. So transferring files through let’s say SMB might work at full speed but NFS could be slow. Then as well there is one question not being asked as far as I can see. Is this imaging multicast or unicast and how many clients at any one time? Fair call, I’d like to think there’s no shaping though due to the fact it’s only myself and my manager in the IT team and we haven’t really had the need to shape traffic. I suppose it could be been set prior to us but I think it’s unlikely. I believe I’m doing a unicast image (since I haven’t used the multicast image tab), typically it’s just the one client however I kicked off two not that far apart just to see if the speed would drop back on the first but that continued to rise whilst the first one started at about 5/6, but that’s more a slow climbing to begin with so I couldn’t see if both were capable of hitting 15+ together or if/when they’d peak.